Haunted Houses in Louisville, Kentucky are some of the scariest haunted houses in America. Hauntworld.com tries to review only the best haunted houses in Newport, Kentucky. When you are looking for simply the best, scariest, haunted houses in Kentucky there is no other place to search than Hauntworld.com which offers our guests the best information to find Kentucky Haunted Houses including the best haunted attractions in Newport, Kentucky. There are many haunted houses in Newport that claim to the best haunted attraction but only one can truly lay claim to the being the scariest haunted house in Kentucky... USS Nightmare Haunted House in Lexington, Kentucky. Kentucky Haunted Houses are some of the scariest haunted houses in America. Hauntworld.com rates and reviews Haunted Houses in Kentucky and today we offer another scary haunted house in Kentucky. USS Nightmare is one of the best haunted attractions in Kentucky, and each Halloween people from all over Kentucky flock to see one of the best haunted houses in Kentucky. Now enjoy our review of another Kentucky Haunted House. For nearly 20 years, the USS Nightmare has been an annual Halloween destination in the greater Cincinnati region. Each fall, the historic steamboat appears on the Newport, KY waterfront just in time for the Halloween haunting season. Framed by the spectacular downtown Cincinnati skyline, the smashed wreckage of the massive old steamboat seems eerily out of place on the developing waterfront. And that is just how parent company BB Riverboats likes it; it is an attraction that catches your eye and peaks your interest. But, it was not always a decrepit steamboat in such disarray. It was once actually an innovative and powerful steamboat known as the William S. Mitchell. Built in 1934 by the Marietta Manufacturing Company of Point Pleasant, WV, the William S. Mitchell is an enormous 280 foot long steam powered dredge designed and commissioned by the Army Corps of Engineers to tame the wild Missouri River by creating and maintaining a navigation channel suitable for commercial traffic. As the need for dredging subsided, the Mitchell was retired from service and permanently docked in Kansas City destined to become a steamboat museum. But it seemed the spirits of the powerful steamboat had other plans. Under flooding conditions, the Mitchell broke loose from its moorings. Powered by the raging flood waters, the mighty steamboat headed aimlessly down the Missouri River on a harrowing last voyage that was captured on video by the local media and dubbed the Mitchell massacre. Although a small tugboat tried to stop the enormous vessel, its attempts were futile, and the Mitchell scraped its way under the Broa dway Bridge. Upon impact with the Railroad Bridge, the stern crew quarters were crushed. But the journey did not end there. The current pushed and turned the massive dredge sending it onward to another disastrous collision with the old ASB Bridge, and the 30’ smoke stacks were leveled. After hitting a fourth bridge, the dredge was finally stopped. The final voyage was over, but by then, the William S. Mitchell was virtually demolished. The damage was so severe that the museum project was cancelled and the steamboat was headed for the scrap yard. That was until it was discovered by present day owners, BB Riverboats. Saved from the scrap yard, the majestic steamboat now serves as the perfect backdrop for the eerie tale told by BB Riverboats and their crew led by USS Nightmare General Manager, Captain Allen Rizzo. 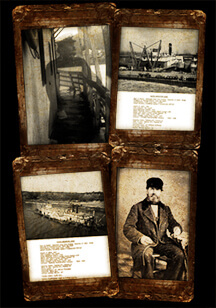 The USS Nightmare tour combines the mystery surrounding the frantic final voyage with the history of the steamboat and the stories of hardships and mishaps as told by surviving crewmembers that worked and lived aboard the dredge. During the initial planning for the tour through the USS Nightmare, the investigation revealed many strange and horrifying stories relayed by the crew. Based on these findings, it appears the mysteries and mishaps that have haunted the boat and its crew began during the boat’s construction with three unfortunate and mysterious deaths. Another bizarre accident reportedly occurred during the launching ceremonies resulting in one death and dozens of injuries. As a result, the steamboat began its 50 years of service with a crew that held many superstitions, and from all accounts, the bizarre and mysterious happenings continued throughout the vessel’s history. Some events could be explained as unfortunate coincidences; others seemingly have no rational explanation. Separating myth from reality is difficult after so many years. But one thing is certain; a cursed and wrecked steamboat with a mysterious crew makes a fantastic storyline for Cincinnati’s favorite haunted attraction, the USS Nightmare. Many of the surviving crewmembers believe the real trouble started when dredging during the maiden voyage uncovered an apparent ancient Indian burial ground. Later that same year, dredging operations were halted when the pump became clogged with what was later identified as a mast from an ancient sailing vessel. According to the legend passed among crewmembers, the operations of the large dredge in clearing the long uncovered riverbed were disturbing the eternal rest of past mariners and an ancient sacred burial ground. Some believed it was the souls of those disturbed mariners that haunted the William S. Mitchell and cursed all of the crewmembers to an eternity of unrest and horror. The man at the helm of the majestic steamboat was Captain William Mitchell, the grandson of the boat’s namesake who grew up on the river living with his father, the original captain of the dredge. The young Captain Mitchell became the master of the steamboat at an early age when his father mysteriously vanished during a late night storm under mysterious circumstances. Although his body was never found, it was assumed that the mutinous crew had thrown the captain overboard. Throughout his years of service on the vessel, Mitchell had various family members living on board including his wife, grandmother, his twin brother, and his daughter, Anna. The family was largely kept distant from the hard-working crew of the vessel. There are few mentions of the captain’s family among the records of the vessel – either the official records or the crewmembers’ journals. Although there is no record or known cause of her death, it is understood that the captain’s wife died when Anna was a very young child. Afterwards, Captain Mitchell became increasingly more protective of Anna, his only child. To this end, Captain Mitchell had many of the forward staterooms modified into the family quarters which included his private stateroom and office, the captain’s dining room, and a special area for his young daughter. Anna had a bedroom and play area secluded from the rest of the crew and safe from the dangers of the steamboat and dredge operations. She was schooled on the ship and had some of the finest toys a girl could want. The captain even had professional circus clowns living on board to entertain her. But, Anna was a curious young girl who quickly tired of the isolation and reportedly found hidden passages through the boat to get out around the crew and watch the crewmembers and her father. Although he tried to keep life as normal as possible for Anna, the captain and the crew of the William S. Mitchell experienced long days and nights of hard, grueling, demanding work. These difficulties changed the demeanor of the young likeable captain. He became a very strange and hardened man who distanced himself from the crew who had become his trusted friends. He began to collect the spoils uncovered by the dredging operations – items the crew found to be very unusual. He collected quite a treasure trove of unique and bizarre things (not to mention his bizarre additions to the crew) from an unhatched gigantic egg to freaky insects and a shrunken head. Eventually, the captain was himself an isolated man wandering through the enormous vessel leading a loyal crew who barely recognized him. Eventually, the captain and crew of the William S. Mitchell had completed their work along the Missouri River, and they faced the end of their journey onboard the historic steamboat. But, it seemed they would face one last mystery before the Mitchell would come to an end. As legend has it, on a foggy night as most of the crew slept, the night watchman was making his rounds. Strange sounds were floating through the mist, strange even for the Mitchell. Growing ever more concerned as the sounds grew more intense, he thought about alerting the Captain who was below deck in a part of the ship where most crew members were not allowed. But he also knew he must not disturb the Captain for fear of being thrown in the brig, or worse. His hesitation probably cost him his life. Just then, a thunderous noise came from the bow of the boat. As the night watchman raced forward, he saw lines that had been snapped and realized the boat was drifting into the river current. He panicked and sounded the general alarm. The Captain was the first to appear. “You fool,” he screamed as he saw the vessel had broken loose. He ordered all engines started and all hands on deck. As the crew appeared and ran to the bow, even in their sleepy daze they realized the danger ahead. The boat was caught in the main current, careening blindly into the darkness. A bridge loomed up through the fog directly in their path. Then came the first of what would be many agonizing crashes followed by the excruciating sounds of crunching steel. Screams penetrated the thick fog reverberating throughout the vessel. The crew had no control of the boat as it went spinning downstream at the mercy of the current and obstacles that lay ahead. What actually happened that night is not clear. The ship did crash hitting several bridges along the way, but the captain and crew were never found. The USS Nightmare visitors today begin their tour on the bow of the steamboat surrounded by massive steam equipment and unique dredge equipment as they watch historical news footage of the perilous last journey that transformed the William S. Mitchell into the USS Nightmare. As they wait to enter the dark attraction, spine tingling screams emerge from within the vessel setting the scene for their impending entry. The tour of the USS Nightmare takes the fright seeker into all areas of the historic steamboat providing a glimpse of the dangerous and somewhat demoralizing life on a working steamboat dredge. Upon entering the USS Nightmare, visitors enter the dimly lit Mitchell Museum displaying some of the bizarre and creepy oddities collected by Captain Mitchell with everything from old family photographs and documents to gigantic insects and a shrunken head. Making their way through the eerie steamboat, the fright seeker encounters some of the captain’s strange crewmembers including the one of the steamboat’s trademark characters, the Rat Lady who sits and plays with her rodent friends. And, that is just the beginning! 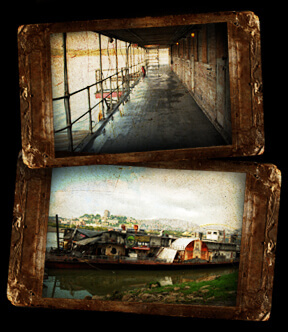 The 30 minute journey through the vessel wanders through twisted passageways encountering more than 40 terrifying scenes encompassing two levels and 20,000 square feet surrounded by the actual workings of the historic dredge. Visitors will get a feel for what life must have been like on this historic steamboat as they realize the vast requirements needed to house a crew of over 60 people for day and night operations. Areas that once served to provide for the daily needs of the crew have been taken over by evil spirits from the psychotic physician to the belligerent half man, half boar butcher. On their journey, visitors may also discover the captain’s bizarre pet, the giant 13’ Impaler, that was hatched from a strange egg collected and nurtured by the captain. It is often hard to tell whether visitors are encountering the tortured spirit of a crewmember, a strange creature collected by the eclectic hoarding captain, or a combination of the two. Regardless, each of the characters along the way is more than willing to have their guests stay as their latest victim. As they continue along the meandering path, visitors will experience the vastness of the vessel. As they walk over the open grated catwalk between the vessel’s two levels, the cool mist from the Ohio River provides an additional level of creepiness to the experience. The fright seeker will also understand the isolation of the Mitchell family life as they visit the captain’s quarters and Anna’s bizarre playroom. The eerie giggles and taunting by the captain’s demented daughter set the scene for the dark, demonic playroom. They will also encounter the fun house and the creepy circus clowns brought onboard for Anna’s entertainment. And if they are lucky, they might just come face to face with Captain Mitchell himself! The journey through the USS Nightmare plays on mankind’s most common phobias including the fear of heights, the fear of confined spaces, the fear of creepy crawling creatures, and the fear of being eaten alive. As visitors adventure through the complex equipment of the vessel in the engine room, the pump room, and the boiler room, they become acutely aware of the eeriness innately associated with the historic steamboat. If only the walls could talk, they would tell the twisted tales of Captain Mitchell, his family, and his creepy crew. The stories of the ghastly crew of the steamboat combined with the original inner workings of the vessel provide the frightening story used as the theme of the USS Nightmare, Greater Cincinnati’s top rated haunted attraction. 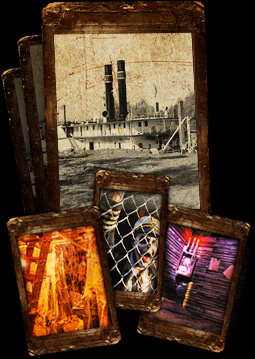 The attraction starts with an incredibly unique setting with original equipment and a mysterious history and builds a believable legend perfect for a haunted event. The core group of USS Nightmare employees has hundreds of years worth of combined haunt industry experience and expertise that provides the USS Nightmare with Hollywood quality sound, lighting, animation, special effects and makeup. This depth of knowledge helps set them apart from other haunted attractions and earns them local and national recognition annually. Each year, the USS Nightmare strives to build on and improve from the previous season. Makeup, costumes, character traits and décor are tweaked to provide the best possible haunted attraction. As the demographic group for haunted attractions change, the USS Nightmare adapts to address their visitors’ needs. The regular shows capture the largest portion of the haunt’s visitors – an audience out for Halloween entertainment with a dose of fright. For the younger audience, the USS Nightmare offers a special lights-on matinee show perfect as a trial run for those who might not be ready just yet for the regular dark show. And, in 2010, the USS Nightmare offered an Unrated Extreme Night for a late night audience over the age of 18. For this show, the steamboat was darker, the visitors were more isolated, and the actors were given freedom to get closer and more confrontational than during the regular show. The USS Nightmare also offers a variety of ticket packages with added savings, group discounts, and a private party space for seasonal gatherings. According to General Manager, Allen Rizzo, “The industry in the past 20 years has become more sophisticated creating a more sophisticated fright seeking customer requiring haunted attractions to take steps to stay ahead of the curve in providing what the customer wants and more.” The crew of the USS Nightmare work diligently to stay ahead of the curve. When they first started 20 years ago, things were much different. Gone are the days when fright seekers could pay $5 and enjoy being scared by loud noises and sudden movements. Today’s fright seekers want more. The USS Nightmare prides itself on recognizing and implementing the ever changing demands of the fright seekers. The USS Nightmare was one of the first haunted attractions to utilize express ticketing options. Now a common occurrence, the USS Nightmare’s RIP express ticket allowing faster entry for an increased ticket price (and increased revenue) was unique for its time. The USS Nightmare also recognized the need to allow customers to participate and interact with the show. Whether it is a scared child tucked safely away in the chicken coop waiting for their group or visitors on the bow waiting entry, visitors have opportunities to use various interaction stations to participate in scaring guests. The USS Nightmare also started early selling online tickets – for individuals, groups, and even packages with other local haunted attractions. In today’s economic times, the value added option has helped increase attendance for all attractions involved. The USS Nightmare has even expanded adding a larger exit area including additional concessions, video games, and the country’s only floating laser tag arena, Laser Rage. As always, plans are currently in the works for this year’s 20th year of the USS Nightmare.